영어에 대한 잡생각 The Threequel! 한국인한테 어려운 전치사 때문에 머리만 아프시죠? 죄송하지만 최근에 불규칙적인 사용법이 또 하나 생각이 나서 말씀을 드리려고요. ‘머리 아파’를 영어로 말하고 싶으면 ‘I have a headache’ 또는 ‘My head hurts’ 이라고 하시면 됩니다. 다리가 아프면 ‘I have a leg ache’ 이라고 안 하고 ‘I’m having some pains in my leg’ 또는 ‘My leg is sore,’ 하시면 되고요. 그러나 위에 대해서 얘기할 때는 ‘to’ 라는 전치사를 붙여야 합니다. 예를 들어서 ‘I’m sick to my stomach,’ 또는 ‘I’m feeling really sick to my stomach,’ 진짜 많이 쓰는 말들입니다. 물론 ‘I have a stomachache’이라는 말도 항상 됩니다. 하지만 ‘I’m sick to my head/leg/foot’ 같은 표현은 없어요. 대신 언제나 무슨 부위에 대해서도 되는 유형을 알고 싶으시면 ‘My ~ hurts’ 딱 좋을 것 같아요. ‘My leg/arm/eye/stomach/head hurts’ 다 자연스럽고 문법적으로 맞습니다. I’ve been having really severe pains in my right thigh for the last two weeks or so. Whenever I put in my contacts, my eyes hurt for about ten minutes. I love street food, but, unfortunately, it often makes me sick to my stomach. Why does his name have an asterisk next to it? 전화기를 보면 맨 밑 줄에 ‘0’ 양 쪽에 있는 기호 두 개 있잖아요. 미국에서 왼쪽에 있는, 한국에서 ‘샤프’이라고 불리는 것은 ‘pound’ 라고 합니다. 반대 쪽에 있는 건 한국말처럼 ‘star’라고 하고요. ‘샤프’하고 똑 같이 생긴 것 또 있는데 악보에 나올 때만 ‘샤프’ 라고 하죠. 반음을 높인다는 의미고 반음 낮춘다는 의미로는 ‘flat’이라고 합니다. 별표하고 비슷하게 생긴 ‘*’ 이 기호는 산문에 등장할 때 ‘2차 적인 정보도 있다는 의미고 ‘asterisk’라고 부릅니다. 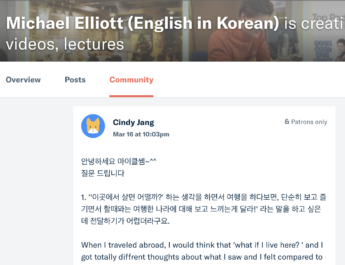 예를 들어서 야구선수 Mark McGwire같은 경우에 MLB의 홈런 기록을 새로 세웠는데 경기력을 향상시키는 약품(performance-enhancing drugs)을 복용하면서 그랬어요. 그래서 야구 기록이나 야구 역사책을 보면 그 선수의 기록 옆에 항상 asterisk (*)가 있죠. 영어로 ‘나 오늘 늦잠 잤다’는 말은 ‘I slept in today’예요. 그런데 이 표현은 의도적으로 그랬을 때만 씁니다. 알람을 못 듣고 계속 잤다’는 말은 ‘I slept right through my alarm,’ 또는 ‘I overslept today’ 입니다. I missed a very important meeting with a client today because I overslept. One of my hobbies is sleeping in on Sunday mornings. ‘Today’s morning’이나 ‘yesterday’s night’ 같은 표현이 없습니다. ‘This morning’ 과 ‘last night’ 이나 ‘yesterday night’ 을 쓰시면 됩니다. 앞에서 했던 말이 실제로 이뤄지기를 바랄 때 쓰는 표현입니다. 예를 들어서 ‘책이 한권 출간되면 ‘knock on wood’ 내 사이트도 인기 더 많아질 것 같다’고 하면 됩니다. Once Mom gets out of the hospital — knock on wood — life will start to return to normalcy. I haven’t had to get in a physical confrontation with anyone for the last ten years — knock on wood — and I hope things stay this peaceful in the neighborhood. ‘Assign homework’ 학생들한테 숙제를 시키는 것은 영어로 ‘assigning homework’예요. 예를들어서 ‘My science teacher assigns way too much homework. I think I’m going to have to drop that class this semester. 물론 ‘give homework’도 됩니다. I can’t believe Mrs. Burton gave us so much homework to do over winter break. The Threequel 이 무슨 뜻인가요? so It means “3탄” right? 인용처를 밝히고 공개로 해도 될까요? 좋은 글을 읽을 수 있게되어 항상 감탄과 고마움을 느끼고 있습니다. 계속 수고 해주시기 바랍니다. 항상 건강하시구요….사랑합니다. 출처를 밝히시고 올리면 저도 좋습니다. 이 사이트에 올린 글들이 많이 퍼져서 여러 사람이 나눌수록 좋으니까요.